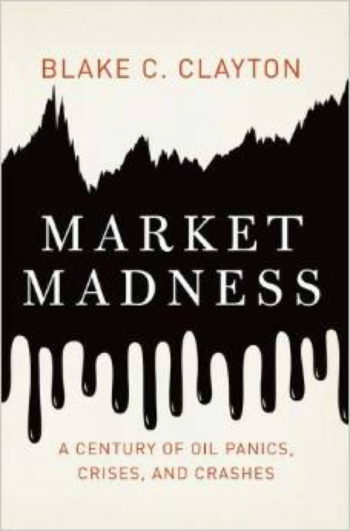 Market Madness: A Century of Oil Panics, Crises, and Crashes traces the history of generational fears in the United States of an imminent and irreversible shortage of oil. Built around four historical case studies, the book explores the conditions under which these mass scares arise, gain popularity, and eventually wane. It also connects the role of these beliefs to the wild price swings that have taken place over the last decade and in the dramatic events the 1970s. Blake Clayton argues that the lessons to be learned from this history are the need for quality data about US and global oil reserves, the importance of clear communication from public officials about energy markets and resources, and the value of transparency in commodities markets. While these measures will not eliminate volatility and unpredictability in energy markets, he writes, they would mitigate unnecessary price spikes and improve investor and government decision-making. His is the first study of its kind to employ Yale economist Robert Schiller’s “new era economics” concept to better understand the dynamics of speculative bubbles and irrationality in the global commodities market. by employing it beyond the two markets to which Schiller famously applied it—the 1990s dot-com equity market and then the mid-2000s housing market—in order, it breaks new ground in detailing how mass beliefs about the future of a vital asset like oil affect the way financial markets work and how public policy is crafted.